The Last Summer of Us is the story of three Welsh teenagers as they go on a spontaneous road trip to make the most of their time together. While things are changing around them, a few days away from their usual lives allows our narrator to begin to figure out how she feels about these changes. I had high hopes for this book due to the recommendation from Sarah over at ClumsinessAsACurse on YouTube combined with the fact I am a Welsh teenager about to leave my friends behind as we all head off to university in September but it just didn't quite live up to my expectations. While it was a decent book and I can definitely see why many people will love it, it just didn't quite do it for me. I found elements of it incredibly frustrating. While I understand that it is fictional and the events in the book do not necessarily have to be realistic, I struggled with the fact the characters were seemingly in a typical Welsh costal town and then ridiculous things were thrown in, such as an elephant at one point, which just confused the boundaries between reality and fantasy for me. While some people may love this aspect of the book, I found it somewhat annoying, especially considering the book did not need these elements to be interesting. It felt as if Maggie Harcourt was trying to keep the reader interested when simply the relationships between the three main characters were absolutely enough to do this. Like I said, this book is definitely not a bad book by any stretch of the imagination and I did really like all of the characters, each of whom is battling through their own personal issues that are gradually revealed throughout the book. I just found that unrealistic events combined with a few frustratingly obvious and unoriginal metaphors somewhat ruined it for me. 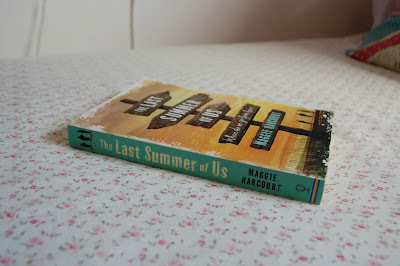 Have you read The Last Summer of Us? What did you think of it? Let me know in the comments below!